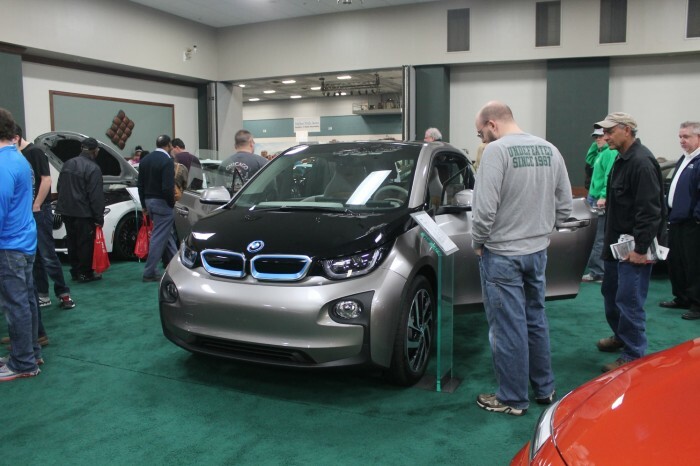 The News Wheel's Rebecca Bernard accidentally finds love at the Dayton Auto Show. As someone who spends most of her days writing about cars, I decided to visit a local auto show to see some of the models I have read so much about. Not only would the Dayton Auto Show have the current models from the major manufacturers, but the 2015 Ford Mustang and Ford F-150 were also scheduled to be in attendance. After all of the buzz about the Mustang’s redesign and the F-150’s aluminum body, it wasn’t something I could miss! Now, I should say up front that I am a fan of American cars. My grandfather was an engineer with General Motors, and I currently drive a Ford Focus. Mazda and Hyundai have great lines and solid engineering, but there’s nothing like national pride to sway a buying decision. Imagine my surprise when I step onto the auto show floor and a German car catches my eye! The BMW i3 had prime placement near the door, and its proximity to a bright orange BMW Z4 certainly helped it to stand out. A small, unassuming vehicle, the all-electric BMW i3 was grey and black, with blue highlights around the BMW logo and vents. However, it seemed larger with both opposing doors opened wide for easy access to the cabin. When I was finally able to sit in the car, I was surprised to find wood in the interior! Everything felt so luxurious, but not boxy and bulky like the also-present Cadillac ELR. 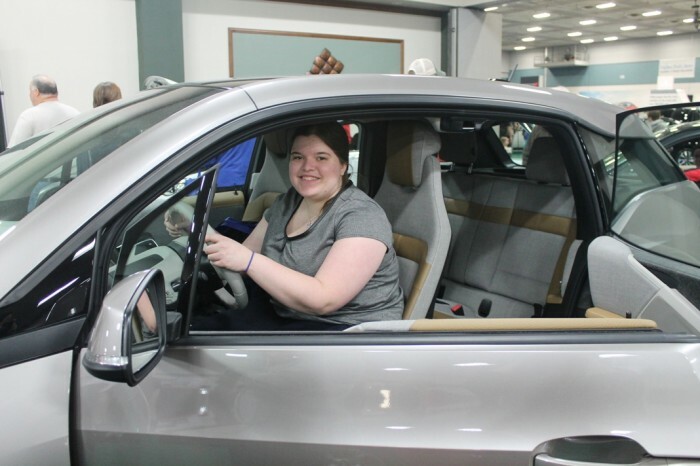 Unlike other electric models, which often take a standard car model and add batteries, the BMW i3 was designed to be sustainable in more ways than just its fuel source. The care and craftsmanship comes through in all the little details you see walking around the vehicle. The salesman on hand informed me that the interior was designed to be as sustainable as possible, with the fabrics being almost all recycled material and the plastic partially recycled. The wood on the dashboard and interior panels is from the eucalyptus tree, which grows fast to replace what has been taken. Its 80-100 mile range per charge range was even thought over based on the average distance a person drives a day to minimize the need to plug in every night. Before we left, I had my friend take a picture of me in the driver’s seat of the car, and it’s the only picture of me in the entire set. Don’t get me wrong, I still love the Ford Mustang, Chevy Corvette, and my little Focus, but that car gave me a new ride to aspire to. 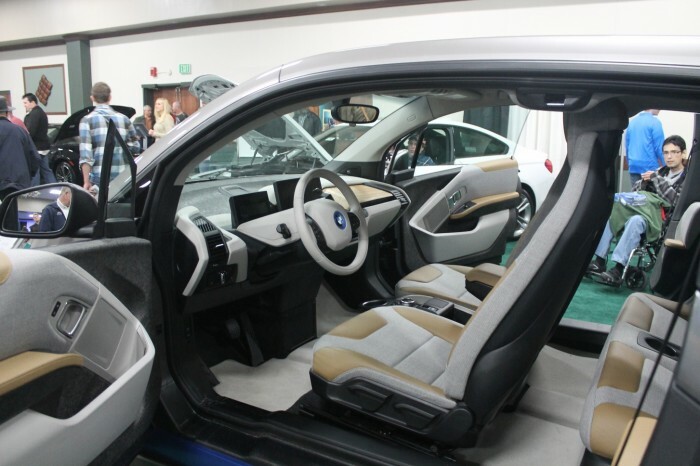 I hope that one day I can drive a car as well crafted and as eco-friendly as the BMW i3. 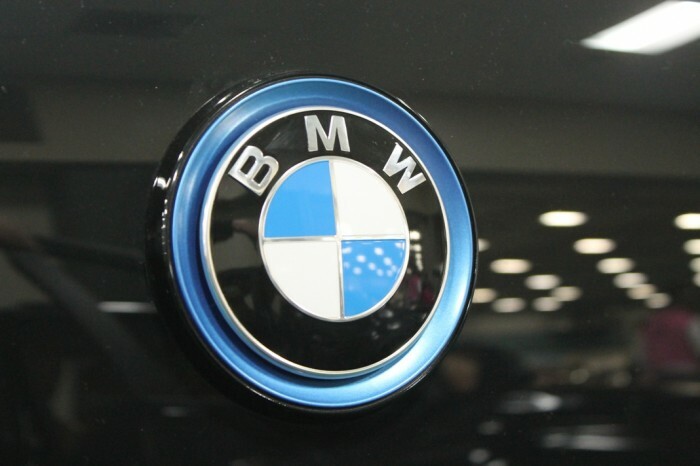 BMW has created the BMW 360 Electric portfolio to assist drivers with the transition to electric and hybrid cars. Lots of trunk space for the i3. The spacious interior of the mini EV.